A signature file is required when you use the geoprocessing tool Maximum Likelihood Classification to classify an image. To create a signature file, you can use the Create Signature File tool on the Training Sample Manager dialog box. Create the training samples using the Image Classification toolbar if they have not yet been created. See the Creating training samples step on how to create them. 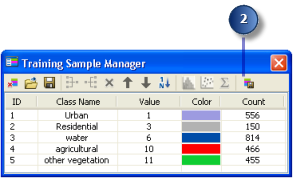 Open Training Sample Manager from the Image Classification toolbar. Click the Create Signature File button. A file browser dialog box appears. On the file browser dialog box, pick a location and specify a name for the signature file, then click OK to save the file. A signature file is created and saved on disk. The Create Signature File button will be dimmed if there are no training samples available in Training Sample Manager.